Bamber Bridge’s supporters almost missed out on seeing new boy Aaron Fleming light-up the Sir Tom Finney Stadium on Saturday. The winger’s superb solo effort on debut helped Brig secure a 2-0 win over Radcliffe Borough – their first NPL First Division North league victory of 2017. Picking up the ball 30-yards out, Fleming ran at the visitors’ defenders before curling the ball into the bottom corner. However, the former AFC Fylde man’s participation in the match nearly did not happen due to an administrative mix up. After being named in the squad earlier in the week, club officials realised at the 11th hour that his registration had not been processed. It meant Fleming had to make a mad dash to Irongate on Saturday morning so that he could sign the relevant paperwork in time for the 3pm kick-off. “We thought we had already processed his signing,” Brig boss Neil Reynolds revealed. “But we relised we hadn’t so Aaron had to rush to the ground on Saturday morning and we managed to get it done at 10-57am – three minutes before the 11am deadline – so that he could play. 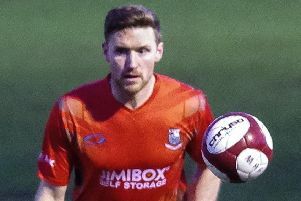 Fleming was not the only player to make his mark on debut, Jordan Southworth also notched after arriving at the club on loan from National League North outfit Chorley. “I’d like to thank Chorley manager Matt Jansen. “He’s given us an opportunity to work with Jordan. They hold him in high esteem there, but they’ve asked us if we would like to work with him. This weekend, Brig travel to Victoria Park to take on Burscough, who are currently at the bottom of the table.